Your content only gets one first impression. 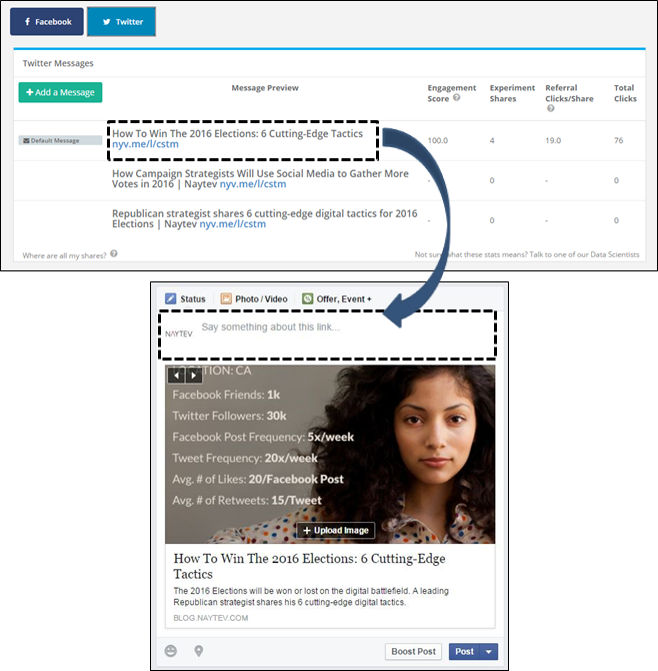 Naytev makes sure it’s the right one by tracking and optimizing organic sharing. The insights we learn from the optimization can be applied across a brand’s larger social strategy. We’re often asked: “Can Naytev boost engagement on my Facebook Fan Page or Twitter handle?” The answer is yes. In this post we’ll share a technique used by many Naytev clients: Take top performing share messages from your active Naytev experiments, and repost these proven messages to your Facebook fans and Twitter followers. For Naytev, that means posting the winning message via our Naytev Facebook Fan Page and Twitter Handle (@GoNaytev) to drive even more engagement. Below is a sample of reposting a message from a Naytev experiment to Naytev’s Facebook Account. Be sure to wait until your Naytev share message experiment has at least preliminary results ready, as indicated by the Phase Indicator in your Naytev Experiment dashboard. The beaker icon indicates that preliminary results are ready, and the check mark icon indicates that final results are ready. Once the experiment is ready, repost away. With social page reach falling precipitously it’s more important now than ever to optimize social media reposting. Naytev gives you the tools to drive much more engagement from your social reposts. Was this helpful? Are the other cool tricks you have found using Naytev? We would love to hear them.